In a large (12- inch) nonstick pan or stockpot, heat broth, onion, fish sauce, chili oil, ginger, chili flakes, coriander and cloves over high heat until simmering. Cook 5 minutes or until onion is soft. Turn off heat and gently add crab to liquid. Return heat to a simmer. 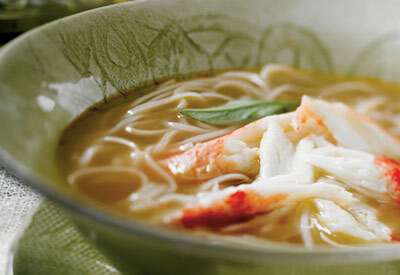 Once simmering, cover pan and cook 4 to 5 minutes for frozen seafood or 2 minutes for fresh/thawed crab. Place 1/2 cup noodles and a seafood portion in a soup bowl. Ladle on 1 cup broth. Garnish with mushrooms, sprouts, basil leaves, cilantro and lime wedge.